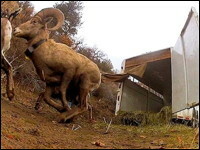 On December 5, 2014, twenty bighorn sheep were released into the Klamath River Canyon, just upriver from Coyote's Paw. The bighorns haven't been seen here for 70 years when unregulated hunting and disease wiped them out. A memory of the sheep has been kept alive in the Old Time stories, and now they're coming back.